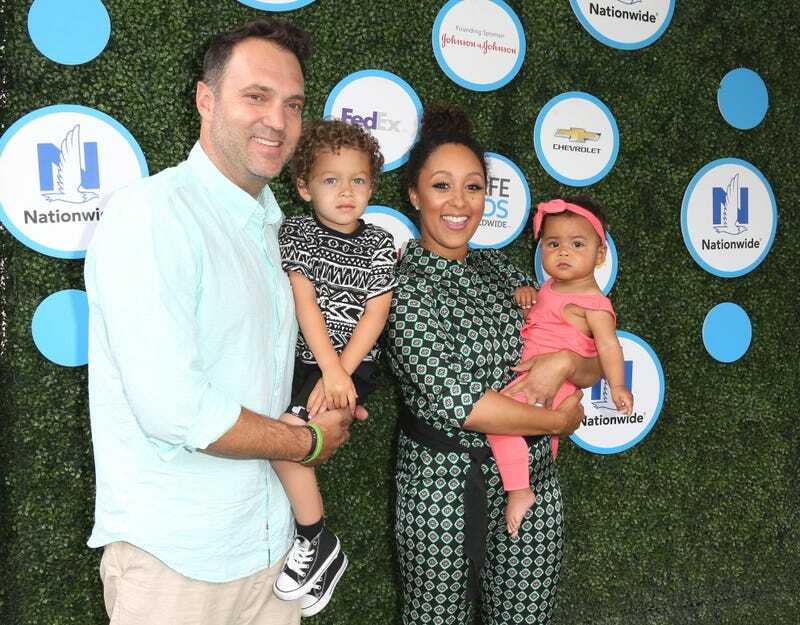 Tamera Mowry-Housley (second from right) with her husband, Adam Housley, and children, Aden John Tanner Housley (second from left) and Ariah Talea Housley on April 24, 2016, in Culver City, Calif.
Tamera Mowry-Housley's Thanksgiving came under fire after she posted a photo showing her white husband, Fox News journalist Adam Housley, making a pot of collard greens. A lot of the comments offered that there was no way a white man could cook greens, and the talk show host actually replied to one comment in particular on Tuesday's episode of The Real. "Ain't no way Adam is making some good collard greens … you must eat like a white person," the commenter said. Mowry-Housley wasn't having it. She went on to explain the origin of collard greens and how they "originated" from Greece. "What they don't know is that Adam's grandmother was from the South, and she passed away before she could spread that recipe to him. My husband loves collard greens," she said. Mowry-Housley also said that her own mother passed on her recipe to her husband, and that not everything has to be about race. Well, at least they weren't greens from Neiman Marcus.